In our last post, The Top Ten Patent Wars #7, we talked about some of the patent wars and the Semiconductor Chip Protection Act that helped shaped Silicon Valley. This week’s entry takes us a little further south to see how patent wars shaped Hollywood and the movie industry. It is little-known that Hollywood became home to the motion picture industry in large part because of a patent war. Thomas Edison, based in New Jersey, was one of the United States’ most prolific inventors (and patent enforcers). Edison did not invent the modern camera (many others made various significant contributions), but Edison later oversaw a team that invented the kinetoscope, which showed moving pictures and was patented by Edison in 1897 as U.S. Patent No. 589,168. In one case challenging the validity of his patents, the Judge ruled in favor of Edison, stating “He did not invent the lens, nor the camera, nor the sensitized tape-like film, nor instantaneous exposure, nor discover the persistence of the eye; but he appears to have invented means for . . . exploiting the illusion.” Edison v. American Mutoscope Co., 110 F. 660 (1901). 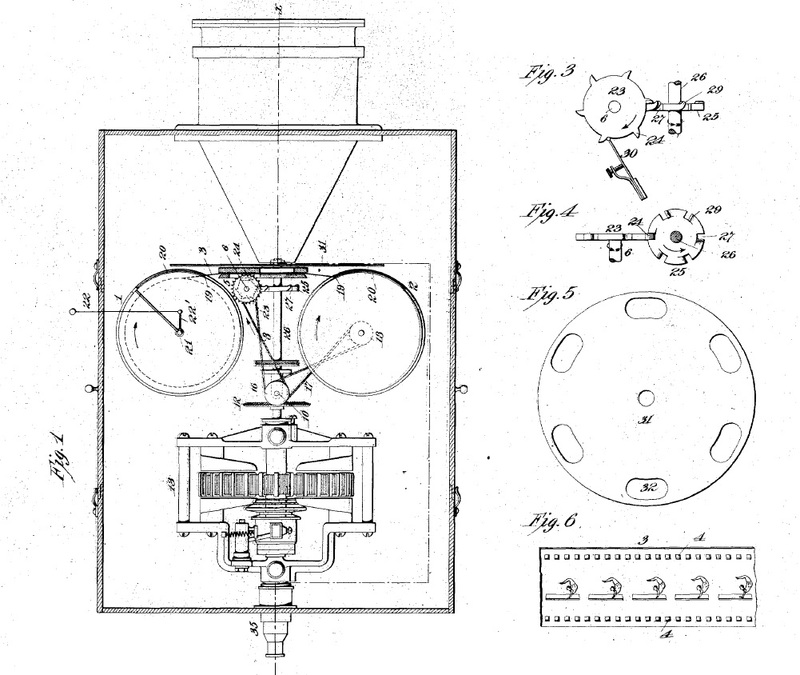 In the early 20th century, Edison gathered together a number of patents for not just the kinetoscope (which was a version of a film projector), film stock (including from Kodak), cameras and projectors, formed the Motion Picture Patents Company (MPPC) in 1908 so that anyone who tried make money by showing “moving pictures” (movies) needed to pay his “Edison Trust” to do so. By the first decade of the 20th century, motion pictures had become commercially lucrative, especially for theaters providing cheap entertainment for many recent immigrants in growing cities. The “Edison Trust” filed dozens of patent infringement lawsuits against others who tried to operate movie theaters. He was sometimes successful and sometimes not. He even bought the famed Latham Loop patent, after warring with its inventors, which innovated how to spool film through a projector to allow for longer movies. It is also rumored that he enforced his patents through other means, such as damaging property and threatening those who worked with non-licensed filmmakers. To get away from Edison and move to courts and locales less likely to be on his side, many independent filmmakers moved West, to a village called Hollywood, setting up companies in a faraway land that also had diverse geography in which to film various types of movies. It is not a stretch to say that patent litigation helped lead to the development of Hollywood as the center for the movie industry. Eventually, the Edison Trust failed because it was too successful. First, the Supreme Court found in Bauer & Cie. v. O’Donnell, 229 U.S. 1 (1913) that a patent licensor could not fix pricing, then Congress passed the Clayton Act, which made the Edison Trust’s type of monopoly (selling goods in return for buyer’s agreement to use certain goods of another), and then finally struck at the MPPC itself in MPPC v. Universal Film Mfg. Co., 243 U.S. 502 (1917), which essentially was a “first sale” case finding that MPPC’s patent rights were exhausted by a sale of those rights so that an independent filmmaker such as Universal was not further tied to MPPC after licensing MPPC’s patents. Universal, and other upstart filmmakers of the time, seized on this new reading of patent and antitrust laws to break free of Edison’s Trust and secure patents, licenses and other goods from various companies. The Supreme Court distinguished licensing of patent rights from contract law, finding that patent law was unique and a patentee could not monopolize the market through patent licensing. Edison’s company left the movie industry shortly afterwards. This established the motion picture industry that we know today, far away from Edison’s Trust in New Jersey. If Edison had not been successful, perhaps the entertainment industry today would be entirely different.